People in all stages of life can be adrift, overcommitted, distracted, or just plain stuck which can keep them from reaching their full potential. 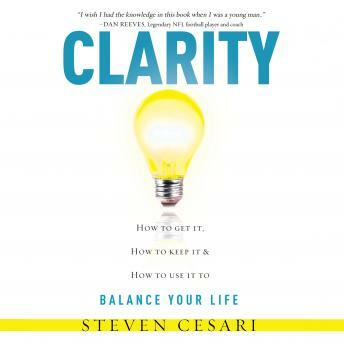 Steve Cesari understands that developing CLARITY, then making proper adjustments is the first step towards leading a happier and healthier life. In his new book Cesari draws on his own personal and professional experiences to help others realize their full potential by empowering, encouraging, and developing a clear vision to achieve desired results. Each chapter is like illuminating a light bulb within the reader allowing them to see and think clearly, in turn igniting their motivation, to take action. Take control and improve your life.